Earlier this summer Wowhaus collaborated with LandDesign to develop a proposal for a public sculpture competition commemorating the US Peace Corps in Washington, DC. 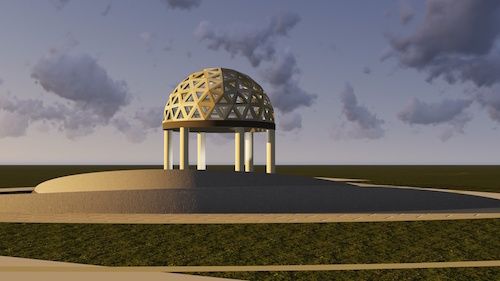 We did not win the commission, but we loved working with LandDesign, and the project gave us a chance to prototype a model of collaboration, and to invent a replicable structure, the Peace Dome. Building on a stacked masonry block technology I developed for our Scuppernong Commons project, I designed a geodesic dome as the centerpiece for the site. The project had special significance for Ene and me; we were Peace Corps Volunteers together in Togo, West Africa in 1990-91. Here are a few images from our design process featuring the dome, whose base would have been stacked, cut stone, with a hand cast dome of earth/cement blocks. We called our proposal Pacem In Terris, and our original, brief project narrative follows below. 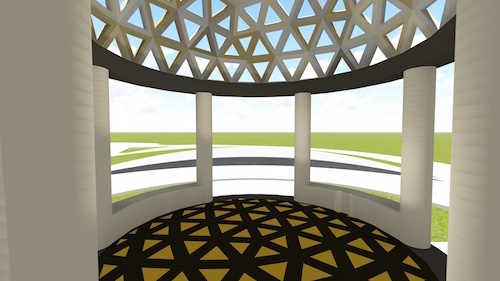 Pacem In Terris reinterprets the universal form of the dome as a human scale symbol of peace, cooperation and interdependency. Each hand-cast masonry block in the dome incorporates the unique soil of a country served by the US Peace Corps. The dome is raised on an open, circular colonnade over a circular stone terrace. The terrace pattern mirrors the masonry blocks overhead, indicating the country of origin of the corresponding block. 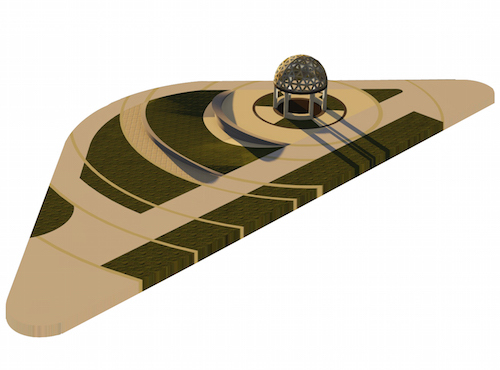 A borderless map of the world is cast in bronze and inlaid into the center of the terrace. Three stacked stone benches alternate with three open spaces between the columns around the perimeter of the colonnade. Terraced, native grasses provide a serene backdrop. The structure invites reflection on the common ground we share, inviting conversation and connection between strangers; it is also an iconic destination for prospective and returned Peace Corps Volunteers. Posted by Scott on September 2nd, 2015, at 2:07 pm, and filed under Uncategorized.